Take your research to the next level and submit to the Augsburg Honors Review! All undergraduate students are welcome to publish illuminating, insightful, and contemporary research in an internationally competitive interdisciplinary journal. Submit your research paper to honrview@augsburg.edu by February 1! RSVP now for the Speaking of Sabbatical event with Christina Erickson, “Spanked, Whupped and Paddled”. Lunch is provided. Posted on January 16, 2019 Email a correction for this post: Paid Fellowship for Trip to Holocaust Museum in Washington, D.C.
Deliberative Dialogue: Should We Eliminate Grades at the University Level? Grading practices and grade inflation are topics that can evoke passionate responses from both faculty and students. However, in this session, we ask an essential question: should grades exist at the university level? See http://inside.augsburg.edu/ctl/ for links to videos you are invited to view before the Dialogue. Updates is where you can find news about Augsburg’s planning for this milestone, including a link to the page to learn about the proposed Sesquicentennial projects. Nike retail representatives will be on campus today tabling in the Christensen Center between 10:00 am – 12:30 pm. If you are looking for a part-time job as a Seasonal Athlete stop to learn more. –How do we abbreviate academic degrees? –Where are commas, colons, and exclamation points appropriate? –What’s an en dash and an em dash, and how are those used differently than hyphens? –What terms do we use instead of “freshman,” “chairman,” and “very”? The marketing department created the Augsburg University and Luther Seminary Editorial Style Guide so you don’t have to guess about spelling, grammar, punctuation, and common terms used around the university. Because Augsburg and Luther marketing and communication staff work together through a shared services agreement, this style guide is designed for use at both institutions. Especially if you write to students, alumni, donors, or other external audiences on behalf of Augsburg, the style guide is an essential tool to polish your message. Bookmark the marketing webpage for convenient access to the style guide. To add a session to your calendar, go to the All Hands page on Inside Augsburg. Join us in Hoversten Chapel at 10:40 am to hear Ole Schenk, Pastoral Intern, preach. Cantor: Deanna Davis, Program Coordinator, Division of Professional Studies, MMT & MA in Leadership Coordinator. Students are invited for worship and communion at 8:00 pm in Hoversten Chapel, followed by waffles and fellowship. 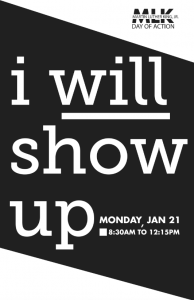 Faculty, Staff, and Students, check the link below for details regarding the Martin Luther King, Jr. Day of Action happening Monday, January 21. Plan to meet in the Chapel at 8:30 a.m. before attending breakout sessions in Oren Gateway Center. Students, faculty, and staff have organized a powerful morning of conversation sessions, a first step in taking further concrete actions to improve inclusiveness at Augsburg, with attention to the learning environment. Workshops will give way to the 1:00 p.m. Convocation featuring Dr. Terrance Kwame-Ross. Everyone is welcome! Be a part of this important day.